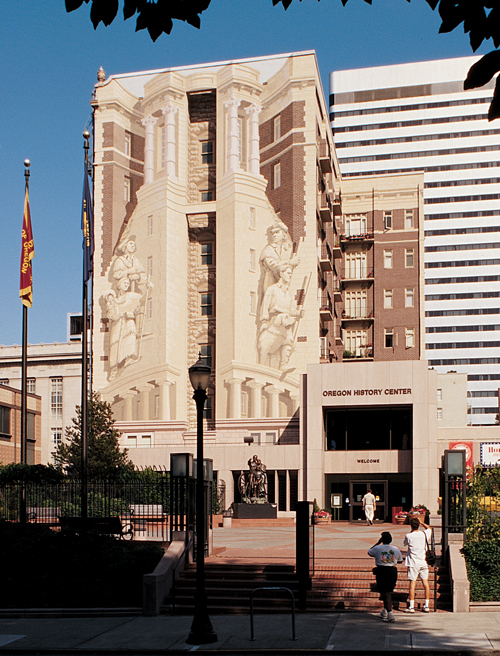 The Oregon Historical Society's building features an eight-story trompe l'oeil mural of the Lewis & Clark Expedition by Richard Haas (1989). Portland, Oregon is a great city and a great place for the Lewis and Clark buff. This weekend I was remembering a near-perfect day I spent a few years ago in The City of Roses. It happened to be my 40th birthday and what a great day it was. For breakfast, we found a great little place near our hotel called the Sunshine Cafe. The staff was Asian but did biscuits and gravy to perfection! It was balm to the soul for traveling Texans. After a yummy meal we headed off to explore downtown Portland. Bishop's House in downtown Portland. We started in Pioneer Square, then headed north to take a look at some of Portland’s ornate historic buildings. Portland has been fortunate in preserving many of these and would make a wonderful place to make a film noir movie. 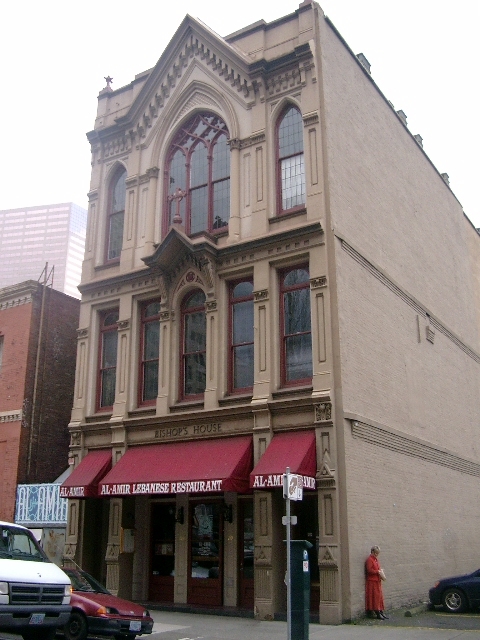 Among the most interesting buildings we saw were the Dekum Building (1892), the New Market Theater (1875), and the Bishop’s House (1879), which in its day has housed a rectory, a headquarters for a Chinese tong, and a speakeasy. It’s near the old police headquarters, and evidently wires ran between the two buildings. Legend has it that it’s unclear who was bugging whom. Today it is home to a Middle Eastern restaurant. We spent some time in the Old Town neighborhood admiring Ankeny Square, which was undergoing a major renovation (which I am told has never been completed. Portlanders, is this true? What happened or didn’t happen?) It looks like there are some neat stores and some fun eateries in Old Town. We also saw all kinds of people, from yuppies to hippies to disreputable types. One thing that we both noticed during our stay in Portland was the number of people wandering around who were obviously high on something. By casual observation it appeared that this city is not much for enforcing public intoxication laws. Portland is also a place of tremendous civic willpower. We walked along the beautiful Waterfront Park, which had been reclaimed from the interstate highway some years ago. This is a great place to run or relax. We were interested to see the mast of the battleship Oregon, a hero ship of the Spanish-American War, and the enormous and impressive Salmon Street Fountain. Learned that Waterfront Park was the scene of a tremendous volunteer effort in 1996, when thousands of ordinary citizens pitched in to save the city from flooding. We took our tired feet to the Park district and the main event of the day, the Oregon Historical Society. It’s great that more and more states have made the effort to create museums where citizens and visitors can go learn about the history of the place. At the time of our visit, we saw a very interesting temporary exhibit entitled “A Fair to Remember,” which recreated the 1905 Lewis and Clark Exposition in Portland. It was fun to learn how the Expedition was commemorated 100 years ago and how the fair really put Portland on the map. Of all the attractions, I would especially liked to have seen the flaming fireworks portrait of Meriwether Lewis. I looked on the society’s website and it looked like there were some amazing exhibits currently on display, including one of amazing art kites commemorating the Lewis & Clark Expedition. Wish I could make it to Portland to see that! The permanent exhibit, “Oregon My Oregon,” detailed the state’s history from Indian times through early explorers, missionaries, Oregon Trail pioneers, and early industries such as mining and logging. This exhibit is very well-done, providing you with a substantive look at many facets of the state’s history without being overwhelming. Had a great lunch at a burrito place called Maya’s Taqueria, then went back to the museum to view more exhibits, including a very interesting exhibit about the battleship Oregon which we had been so intrigued with earlier in the day at Waterfront Park. Dinner was a great birthday treat at Jake’s Famous Crawfish, a very busy and lively restaurant. I got stuffed catfish and Mary got crab cakes. Finished it off with a fabulous chocolate truffle cake! What a great birthday! 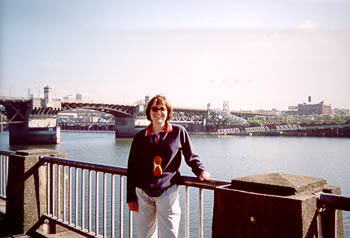 I loved Portland and am more than ready to return to this great city with so much history and close ties to the Lewis & Clark Expedition.